Your guests didn’t expect a lecture on Jesus. Some will be offended unnecessarily. Some will be uncomfortable and feel awkward. Some might be interested in further conversation. There are better ways to do evangelism at Thanksgiving gatherings. 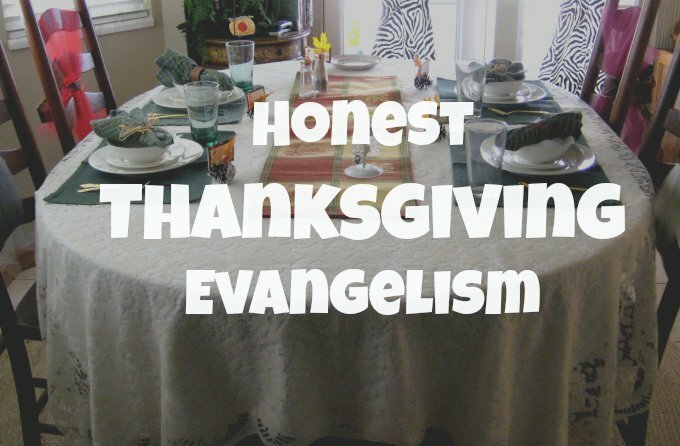 Honest thanksgiving Evangelism can bring more honor to Christ than manipulation or deceit that the setting above sets up. Mention that you’ll be sharing a little about your faith and why Thanksgiving is important to you. Be clear that it’s a personal story and that it will be brief. This sets an expectation in the mind of your Thanksgiving party guest that there will be some no-pressure faith sharing happening. You might have some ice-breakers that touch on thankful themes. You might have people share meaningful stories of thankfulness. You might share one short aspect of your testimony when you have the group’s attention (after all, you said you would in your Thanksgiving party invitations). Then share a piece of your personal testimony. This low key approach still accomplishes some evangelistic activity of sharing some of the gospel and some of your personal testimony. The key is that it was expected at the Thanksgiving party because you mentioned it in your invitation. You don’t have to be a conversational manipulator to force a conversation about Jesus. Those types of conversations really bug me and I find them obnoxious. However, I have found many natural ways to talk about my faith in Christ in many conversational contexts. Thanksgiving provides you with opportunities to express stories of God’s faithfulness to you during the current time of your life. You can tell stories of gratitude to God for the blessings you have received. But these conversations don’t happen without some intentional thinking on your part. Pray ahead of time that the Lord would give you conversational opportunities. Journal ahead of time on particular stories of God’s activity that you might be able to share. Then debrief your conversations later and learn from them. 3. Let the gospel be offensive not you. When you talk about your faith in Christ, talk about your own walk with the Lord. Talk about what God is doing in your life. Talk about the good things God is doing. Talk about what you are learning from your devotional times. When you talk about the message of the gospel, let your conversation be seasoned with salt. The gospel can be offensive, but you don’t have to be.